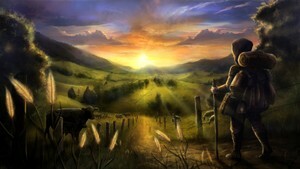 "Farmland" brings you a relaxing farmland setting to travel through between high action battle sequences. Just the sounds of birds tweeting and insects buzzing... oh yes, and crows, cows, and sheep, dogs, roosters and even horses. Each of these animals can be set off as a OneShot too. So if you want to swamp your Players with an farmyard animal horde, just mash those number keys!